travel around the horizon near the North Pole. 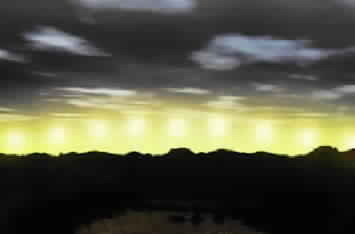 the sun can be used as a compass provided correct local time is known. 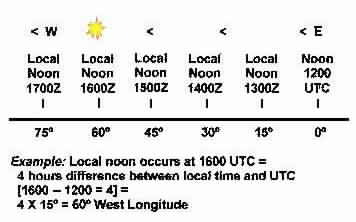 As an aid to determining local time, the sun is at its highest at local noon and its lowest at local midnight. This is true everywhere except at the north pole where the sun circles more or less equidistant from the natural horizon. DETERMINING LONGITUDE BY THE SUN. Again based on the fact that the sun's apparent travel over the earth's surface is from east to west at the rate of 15� of longitude per hour [1� in 4 minutes or .25� per minute], it is possible to determine longitude provided correct local time and Greenwich Mean Time (UTC) are known. This is accomplished by noting the time of local apparent noon (the time the sun is highest in the southern sky) and comparing with GMT [UTC]. The difference--in hours and minutes--then is multiplied by 15 [degrees] to obtain longitude. Note: this method provides an approximation. For exact longitude, it would be necessary to use a sextant to obtain the precise time of local apparent noon and consult an Almanac for corrections to apply to the difference between local time and GMT.